Thomas Telford was responsible for the early 19th century improvements to the main line canal at Birmingham. Having surveyed the original Brindley contour canal across the Birmingham Plateau he declared it “little better than a crooked ditch” and set about carving a straight line across the route. The result was the largest earthwork in the world at the time – a little over 70 feet deep and a mile long – now known as the Galton Valley. It was crossed by the magnificent Galton Bridge, at the time the longest single span bridge in the world. Among his other improvements to the canal system were the Engine Arm feeder canal that crosses the new line and carries water supplies to the old main line across the dramatic, cast-iron Engine Arm aqueduct, a scheduled ancient monument. Telford is also known for his audacious improvements to the old Roman road of Watling Street (the A5) that led from London to Wales. His engineering feats include the masterpiece of the Menai Bridge, a suspension bridge that carries the road across the Menai Strait and onto Anglesey to open up the western port of Holyhead. 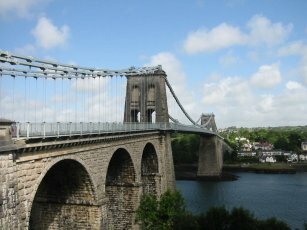 The Menai Bridge was built between 1818 and 1826 at a height of 153 feet, a length of 1388 feet and a main span of 580 feet. The passage of a person’s life is marked by key points where change is taking place. The individual is neither one thing nor another, but moving from one period of stability to a different, altered state. From childhood to adult, from single to married, from life to death, each stage is marked by movement through some form of gateway. Mankind has always celebrated those changes with special rituals, baptism, marriage, initiation or funeral rites. These times are often seen as sacred but also seen as risky, fraught with danger because the soul does not belong in either place until the change is complete. Clear lines are defined to show the passage from one state to another and to remove the grey, hazy area between the two states. Holy water, jumping the broom, ashes to ashes, dust to dust. Once the soul is across the line it is safe. Before it begins its journey it is safe. On the way across it is at risk. At a point of liminality. Hence all the superstition and tradition associated with the many rites of passage of a person’s life and death. The something old, something new, something borrowed and something blue are not just to ensure a long and happy marriage. It is significant that the bride must have the four elements on her wedding day but does not need them afterwards. They are therefore to protect her before the ceremony takes place. Once she is in the gown and on her way to be married she is no longer a part of her original family but has not yet joined her new one. It is for that time that she needs the talismans. Similarly the rituals of death are mostly associated with the time that the corpse is above ground or before it is consigned to the fire. Covering mirrors, sitting with the corpse, lighting candles and the hundred and one other rituals observed by the Victorians before a funeral were designed to ensure that the spirit would rest easy. To make sure that the soul did not wander the earth because it had no proper “send-off”. The burial, headstone and inscriptions ensured that the body stayed where it was put, the other observances were to guarantee that the soul went on its way and did not hang around to hamper the living. 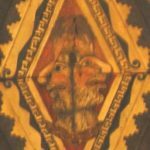 Janus face on Peterborough Cathedral nave ceiling. In much the same way the boundaries between rooms or recognised areas in all walks of life were often associated with passage rituals. A captain is piped aboard his ship to mark his movement from dry land to sea. Many religions and cultures expect the removal of shoes when entering a house. In northern climes it is considered extremely bad luck to walk on the doorstep and for some Mongolian tribes treading on the door stone was a capital crime. There are many superstitions associated with bridges – not least the fact that the bridge in the tale of the Three Billy Goats Gruff was guarded by a troll. Many cultures believe that evil spirits cannot cross bridges, an idea that has been corrupted to the notion that witches cannot cross running water. Others are associated with doorways. The Romans, for example, had their own two-faced god Janus to guard the entrance to their homes and watch over those both entering and leaving – a truly liminal idea.